O Almighty and Eternal God, Lord of the universe, sustain us; we beseech thee o’er the course of “Life’s Tempestuous Sea.” Keep us we pray thee, secure within the bark of Peter, ever trustful of Christ and his vicars to guide us along the ways of peace and prosperity. May Jesus our savior, preserve us in the unity of the holy faith and confirm our hopes of sharing its treasures with America. Send forth the power and love of the Holy Spirit, that we may be blessed in our efforts to set forth thy glory in this land under the patronage of Mary’s Immaculate Conception. Let our Fraternity flourish in justice and charity and give eternal praise and glory to the Most Holy Trinity. Be mindful of each of our brothers, departed, and receive them into the heaven of eternal peace. Amen. 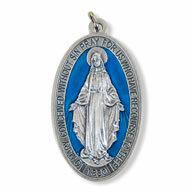 Mary Immaculate, Mother of the Knights of Columbus, pray for us. During this next year please pray this Prayer for Priests. We need more every day to help our world get back on course with God's will for all of us. "Heavenly father, during this Year for Priests, bless our diocese with the grace of many vocations to the priesthood from from our parish. Through the intersection of our Blessed Mother, grant to those You have called, the courage to follow your will. Grant also to those serving as priests the grace to serve with the faithfulness of Christ. We ask this through Christ, our Lord. Amen." I believe in one God, the Father Almighty, maker of heaven and earth, of all things visible and invisible. I believe in one Lord Jesus Christ, the Only Begotten Son of God, born of the Father before all ages. God from God, Light from Light, true God from true God, begotten not made, consubstantial with the Father; through him all things were made. For us men and for our salvation he came down from heaven and by the Holy Spirit was incarnate of the Virgin Mary and became man. For our sake he was crucified under Pontius Pilate, he suffered death and was buried and rose again on the third day in accordance with the Scriptures. He ascended into heaven and is seated at the right hand of the Father. He will come again in glory to judge the living and the dead and his kingdom will have no end. I believe in the Holy Spirit, the Lord, the giver of life who proceeds from the Father and the Son who with the Father is adored and glorified who has spoken through the prophets. I believe in one, Holy, Catholic and Apostolic Church. I confess one Baptism for the forgiveness of sins and I look forward to the resurrection of the dead and the life of the world to come. Amen. I believe in God, the Father almighty Creator of heaven and earth and in Jesus Christ, his only Son, our Lord who was conceived by the Holy Spirit, born of the Virgin Mary, suffered under Pontius Pilate, was crucified, died and was buried; he descended into hell; on the third day he rose again from the dead; he ascended into heaven and is seated at the right hand of God, the Father almighty; from there he will judge the living and the dead. I believe in the Holy Spirit, the Holy Catholic Church, the communion of saints, the forgiveness of sins, the resurrection of the body and life everlasting. Amen. Glory be to the Father, the Son, and the Holy Spirit. As it was in the beginning is now and ever shall be, world without end. Amen. God, our Father, please send us holy priests, all for the sacred and Eucharistic heart of Jesus, all for the sorrowful and immaculate heart of Mary, in union with saint Joseph. Amen. Jesus Mary and Joseph, we love you very much. We beg you to spare the lives of the unborn children. We have spiritually adopted and who are in danger of abortion. AMEN. Holy Mary, Mother of God, I beg you and your beloved husband, St. Joseph. Just as you once cradled your Son, the child Jesus safely in your loving arms, please protect me, God’s precious child from evil men and women who prey upon my helplessness and trust destroying my faith, my hope, my love, my very life. May God bless the world’s abused children. Amen. “The harvest indeed is great, but the laborers are few. Pray therefore the Lord of the harvest to send forth laborers into the harvest.” Father in heaven, Lord of the harvest, in obedience to the will of your son, Jesus Christ, we pray that with the help of his grace many hearts will be moved to answer the call to the priesthood and the religious life. Bless the efforts of those priests and religious now working in the vineyard so that ultimately all may redound to your greater honor and glory through Christ our Lord. Amen. Most Holy Trinity - Father, Son, and Holy Spirit - I adore thee profoundly. I offer Thee the most precious Body, Blood, Soul and Divinity of Jesus Christ, present in all the tabernacles of the world, in reparation for the outrages, sacrileges and indifferences whereby He is offended. And through the infinite merits of His Most Sacred Heart and the Immaculate Heart of Mary, I beg of Thee the conversion of poor sinners. My God, I believe, I adore, I hope, and I love You. I beg pardon of You for those who do not believe, do not adore, do not hope, and do not love You. Remember, O most gracious Virgin Mary that never was it known that anyone who fled to Your protection, implored Your help, or sought Your intercession was left unaided. Inspired with this confidence, we fly to you, O Virgin of virgins, our Mother. To You we come; before You we stand, sinful and sorrowful. O Mother of the Word Incarnate, despise not our petitions, but in Your mercy, hear and answer us. Amen. 2. promise my special protection and the greatest graces to all those who shall recite the rosary. 4. It will cause virtue and good works to flourish; it will obtain for souls the abundant mercy of God; it will withdraw the heart of men from the love of the world and its vanities, and will lift them to the desire of eternal things. Oh, that souls would sanctify themselves by this means. 5. The soul which recommend itself to me by the recitation of the rosary shall not perish. 6. Whoever shall recite the rosary devoutly, applying himself to the consideration of its sacred mysteries shall never be conquered by misfortune. God will not chastise him in His justice, he shall not by an un provided death; if he be just he shall remain in the grace of God, and become worthy of eternal life. 14. All who recite the rosary are my son, and brothers of my only son Jesus Christ. Do you how to correctly pray the rosary? Click here. Oh Angel of God my guardian dear, to whom Gods love in trust me here, ever this day be at my side, to light and guard, to rule and guide amen. God our Father, protector of the poor and defender of the widow and orphan, you called your priest, Father Michael J. Mc Givney, to be an apostle of Christian family life and to lead the young to the generous service of their neighbor. Through the example of his life and virtue may we follow your Son, Jesus Christ, more closely, fulfilling his commandment of charity and building up his Body which is the Church. Let the inspiration of your servant prompt us to greater confidence in your love so that we may continue his work of caring for the needy and the outcast. We humbly ask that you glorify your servant Father Michael J. Mc Givney on earth according to the design of your holy will. Through his intercession, grant the favor I now present (make your request). Through Christ our Lord. Amen. Say the Our Father, Hail Mary and Glory be to the Father. Saint Michael, the Archangel, defend us in battle, be our defense against the wickedness and snares of the devil. May God rebuke him, we humbly pray; and do thou, O Prince of the heavenly host, by the power of God, thrust into Hell Satan and the other evil spirits who prowl about the world for the ruin of souls. Amen. May today there be peace within. May you trust God that you are exactly where you are meant to be. May you not forget the infinite possibilities that are born of faith. May you use those gifts that you have received, and pass on the love that has been given to you. May you be confident knowing you are a child of God. Let this presence settle into your bones, and allow your soul the freedom to sing, dance, praise and love. Dear God, At this Mass, please give me the grace I need to refrain from judging the heart of the priest, the readers, the singers, the ushers, the eucharistic ministers and every other person who volunteers in our parish. Give me the grace I need to mean the prayers I speak, the songs I sing and the gestures I make. Dear God, help me not to pull back in judgment but to lean forward and Pray this Mass and all Masses with love and understanding. Amen. Oh most beautiful flower of Mount Carmel, fruitful vine, splendor of heaven. Blessed Mother of the Son of God, Immaculate Virgin, assist me in my necessity. Oh Star of the Sea, help me and show me you are my mother. Oh Holy Mary Mother of God, Queen of Heaven and Earth, I humbly beseech you from the bottom of my heart, to succor me in necessity (make your request). There are none that can withstand your power. Oh Mary conceived without sin, pray for us who have recourse to three (3 times). Holy Mother I place this prayer in your hands (3 times). say this prayer 3 consecutive days, publish it to others and it will be granted to you. Heavenly Father, thank you for the gift of our family. Enlighten our hearts and minds that we may live more fully, this vocation to love. In our daily life and work, may we reflect the self-giving love which you. O Father, eternally show with your Son and the Holy Spirit. Let your love be evident in the peace that reigns in our home and in the faith we profess and live. May our family always be a place of generosity, understanding, forgiveness and joy. Kindly give us the wisdom and courage to be witnesses to your eternal design for the family; and grant that the Holy Family of Nazareth may always guide our path to holiness as a family. We ask this through our Lord Jersus Christ, your Son, who lives and reigns with you in the unity of the Holy Spirit, one God forever and ever. Amen. For a list of Arizona Retreat Centers, click here. "Explaining the Catholic Mass." Click here.